Premier Redford’s remarks yesterday following the recent Plains Midstream Canada pipeline failure north of Sundre really underlined the importance of keeping track of the history of oil pipeline spills in Alberta in both the the recent and deeper past. “It’s actually an exception,” Redford said in regard to the Red Deer River and Glennifer Lake oil spill, “if you think that we have hundreds of thousands of kilometres of pipelines across this province.” The premier used the same metric that is used by the Energy Resources Conservation Board to evaluate the safety of the pipeline system in many of its press releases regarding oil spills in the past: number of pipeline failures compared to the total length of the system. The problem, of course, is that her logic obscures the environmental risks of liquid hydrocarbons leaking into critical waterways and the regularity of such spills. Even if just one pipeline rupture occurs along the more than 399,000 kilometre network in a given year, it can still have devastating environmental consequences. 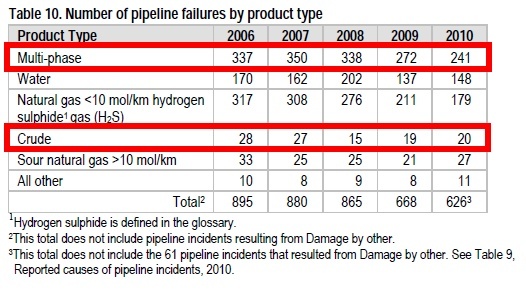 And in 2010, according to the ERCB, there were 261 ruptures on crude oil and multi-phase pipelines that spilled roughly 21,000 barrels of oil (~3,400 cubic metres). If we dig deeper into the ERCB numbers, it is clear that oil pipeline spills on Alberta’s very large network occur more frequently than the premier’s remarks suggested. For example, in 2009 there were 19 ruptures on crude oil pipelines and 272 on multi-phase pipelines (combination of crude oil and gas). In total, these failures spilled about 47,767 barrels of oil (~6,800 cubic metres) across the entire pipeline system. That’s more than 47 times more oil spilled than the lowest estimate for the recent spill on the Red Deer River and Glennifer Lake. Yesterday’s spill near Sundre hardly seems exceptional. Thank you for the work you are doing, it is rather frightening how much information is being withheld from the public these days. Many of us are very gratefull for the work you have done in exposing the truth. Thanks for the encouraging words and thanks for reading my articles. I’m glad to know this research is having some impact. One thing to remember is that all of the historical data I used in my research came from publicly available documents (regulator and newspaper reports).